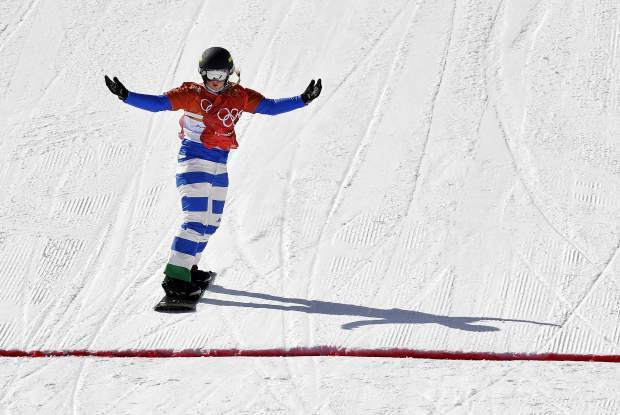 PYEONGCHANG, South Korea — Italy’s Michela Moioli won the gold medal in Olympic women’s snowboardcross Friday, overtaking American Lindsey Jacobellis about halfway down the course, then beating the rest of the field to the finish line. Jacobellis placed fourth, continuing her hard-luck career at the Olympics. The sport’s most decorated rider, Jacobellis has failed to return to the podium since settling for silver after an ill-advised jump in 2006 while she was clear in the lead. ‘’I mean, I could be upset about it, but where is that going to get me?” Jacobellis said. Julia Pereira de Sousa Mablieau of France took silver. Defending champion Eva Samkova, who stenciled on a red-white-and-blue moustache and soul patch to represent her country, the Czech Republic, skidded across the line for bronze. Jacobellis had about a two-body-length lead on the field when Moioli overtook her on a curve. Samkova drafted behind and pushed Jacobellis out to the edge of the course and, from there, she couldn’t gain any ground. This was the first time Jacobellis had even raced for the Olympic gold since she took the fall in Italy. At the two ensuing Olympics, she went off course in semifinals and had to settle for winning the consolation bracket. With her 27 World Cup wins, nine Winter X Games titles and a better than 60-percent rate of podium finishes, the 32-year-old American has shown amazing consistency in a sport that’s often random because of the tight quarters and danger at every turn. Her silver-medal performance in Italy is still remembered as one of the grandest of Olympic flubs. She was dominating the field that day and had nothing to do but coast to the bottom. But she celebrated too soon, and flew over the last jump using an unnecessary stylish method grab. She lost her balance on the landing, fell, and got passed at the line. The winner that day was Tanja Frieden, though Jacobellis earned all the headlines. While Jacobellis failed to flip the script, this marks a new chapter for Moioli, who gave Italy its second gold medal of the games. But it wasn’t a surprise. She has been dominating the World Cup this season with four victories, and now has an Olympic title to add to that record.